DIE Jovis, videlicet, 23 Junii. Letter from the Deputy Lieutenants of Hampshire, about the Execution of the Militia. E. of Salisbury returns to the Parliament. Sir Wm. Balfore to be repaid extraordinary Expences. This and other like Cases to be communicated to the H. C.
Escot sent for, for Words against the Parliament. Lord Balmerino versus Justice Heath. Clobery and others Petition communicated to the Scots Commissioners. Lord Spencer's Offer of Horse. Arding and Morton sent for, for printing scandalous Pamphlets. Countess of Banbury to transport Horses. Proclamation in the City, against levying Forces without the King's Leave. Lord Mayor and Two Sheriffs to attend. 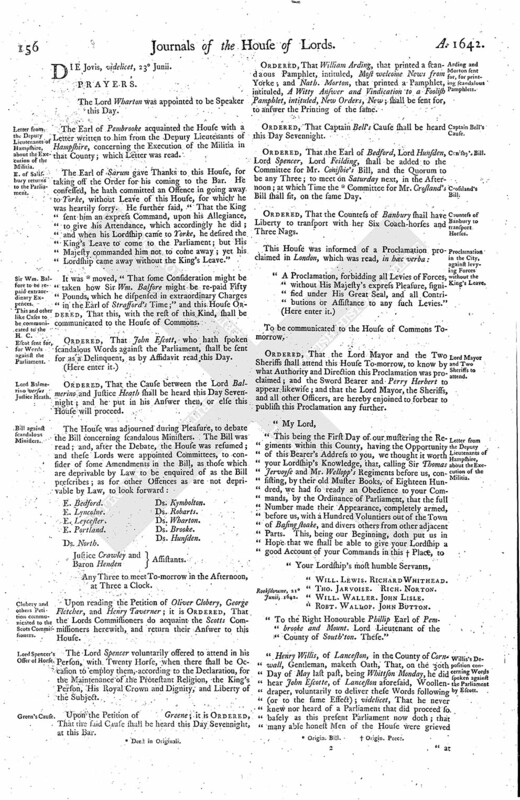 Willis's Deposition concerning Words spoken against the Parliament by Escott. The Earl of Pembrooke acquainted the House with a Letter written to him from the Deputy Lieutenants of Hampshire, concerning the Execution of the Militia in that County; which Letter was read. The Earl of Sarum gave Thanks to this House, for taking off the Order for his coming to the Bar. He confessed, he hath committed an Offence in going away to Yorke, without Leave of this House, for which he was heartily sorry. He further said, "That the King sent him an express Command, upon his Allegiance, to give his Attendance, which accordingly he did; and when his Lordship came to Yorke, he desired the King's Leave to come to the Parliament; but His Majesty commanded him not to come away; yet his Lordship came away without the King's Leave." It was (fn. 1) moved, "That some Consideration might be taken how Sir Wm. Balfore might be re-paid Fifty Pounds, which he dispensed in extraordinary Charges in the Earl of Strafford's Time;" and this House Ordered, That this, with the rest of this Kind, shall be communicated to the House of Commons. Ordered, That John Escott, who hath spoken scandalous Words against the Parliament, shall be sent for as a Delinquent, as by Affidavit read this Day. Ordered, That the Cause between the Lord Balmerino and Justice Heath shall be heard this Day Sevennight; and he put in his Answer then, or else this House will proceed. Any Three to meet To-morrow in the Afternoon, at Three a Clock. Upon reading the Petition of Oliver Clobery, George Fletcher, and Henry Taverner; it is Ordered, That the Lords Commissioners do acquaint the Scotts Commissioners herewith, and return their Answer to this House. The Lord Spencer voluntarily offered to attend in his Person, with Twenty Horse, when there shall be Occasion to employ them, according to the Declaration, for the Maintenance of the Protestant Religion, the King's Person, His Royal Crown and Dignity, and Liberty of the Subject. Upon the Petition of Greene; it is Ordered, That the said Cause shall be heard this Day Sevennight, at this Bar. Ordered, That William Arding, that printed a scandaous Pamphlet, intituled, Most welcome News from Yorke; and Nath. Morton, that printed a Pamphlet, intituled, A Witty Answer and Vindication to a Foolish Pamphlet, intituled, New Orders, New; shall be sent for, to answer the Printing of the same. Ordered, That the Earl of Bedford, Lord Hunsden, Lord Spencer, Lord Feilding, shall be added to the Committee for Mr. Conisbie's Bill, and the Quorum to be any Three; to meet on Saturday next, in the Afternoon; at which Time the (fn. 2) Committee for Mr. Crosland's Bill shall sit, on the same Day. Ordered, That the Countess of Banbury shall have Liberty to transport with her Six Coach-horses and Three Nags. "A Proclamation, forbidding all Levies of Forces, without His Majesty's express Pleasure, signified under His Great Seal, and all Contributions or Assistance to any such Levies." To be communicated to the House of Commons Tomorrow. 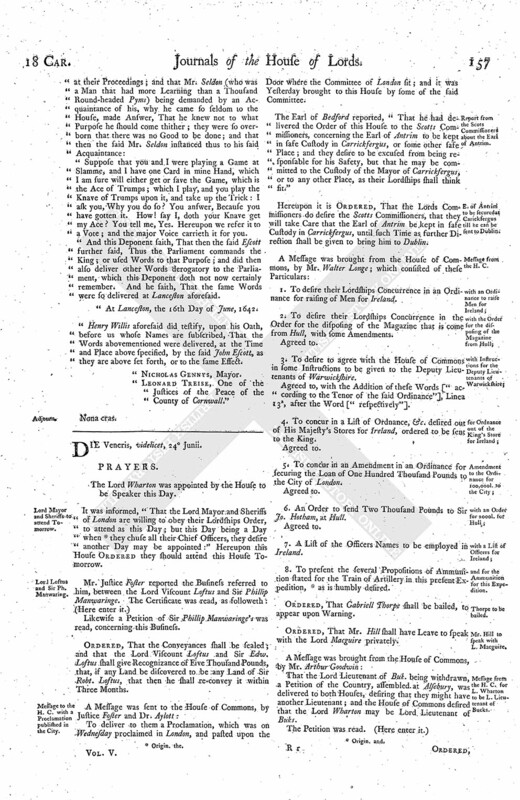 Ordered, That the Lord Mayor and the Two Sheriffs shall attend this House To-morrow, to know by what Authority and Direction this Proclamation was proclaimed; and the Sword Bearer and Perry Herbert to appear likewise; and that the Lord Mayor, the Sheriffs, and all other Officers, are hereby enjoined to forbear to publish this Proclamation any further. "To the Right Honourable Philip Earl of Pembrooke and Mount. Lord Lieutenant of the County of South'ton. These." "Suppose that you and I were playing a Game at Slamme, and I have one Card in mine Hand, which I am sure will either get or save the Game, which is the Ace of Trumps; which I play, and you play the Knave of Trumps upon it, and take up the Trick: I ask you, Why you do so? You answer, Because you have gotten it. How! say I, doth your Knave get my Ace? You tell me, Yes. Hereupon we refer it to a Vote; and the major Voice carrieth it for you. "And this Deponent saith, That then the said Escott further said, Thus the Parliament commands the King; or used Words to that Purpose; and did then also deliver other Words derogatory to the Parliament, which this Deponent doth not now certainly remember. And he saith, That the same Words were so delivered at Lanceston aforesaid. "At Lanceston, the 16th Day of June, 1642. "Henry Willis aforesaid did testify, upon his Oath, before us whose Names are subscribed, That the Words abovementioned were delivered, at the Time and Place above specified, by the said John Escott, as they are above set forth, or to the same Effect. "Leonard Treise, One of the Justices of the Peace of the County of Cornwall."